The last day of a family’s vacation at Walt Disney World goes from horrible to worse. Things get off to a bad start when the father gets a call from his boss that he has been fired. He keeps the news to himself not wanting to spoil their trip. But while on the rides he begins seeing the animatronic faces frowning at him. Then his son gets sick after he takes him on Space Mountain. This leads to a fight with his wife. His only relief from his misery are the sight of two pretty young French girls that he trails throughout the park. At the very least, Escape from Tomorrow is a triumph of guerrilla filmmaking. Since The Walt Disney Company is fiercely protective of their “intellectual property” director Randy Moore shot the movie on the sly, clandestine style. That means his crew did not obtain permits or permission to film. He shot with hand-held cameras commonly used by visitors and tiny digital audio recorders to capture sound. Given the restrictive environment, the production is an absolute marvel of inventiveness. Many scenes are clearly shot at the complex in full view with real patrons in the background. Perhaps to get around copyright laws, no official Disney music from the park is used. This actually strengthens the sinister atmosphere. Weird, alternate music is substituted that give the attractions an ominous quality. At times the director uses green screens with venue locations for the backdrop of extended takes. The effect gives the picture an almost surreal, hyperrealistic quality. Black and white cinematography also adds to the simulation. 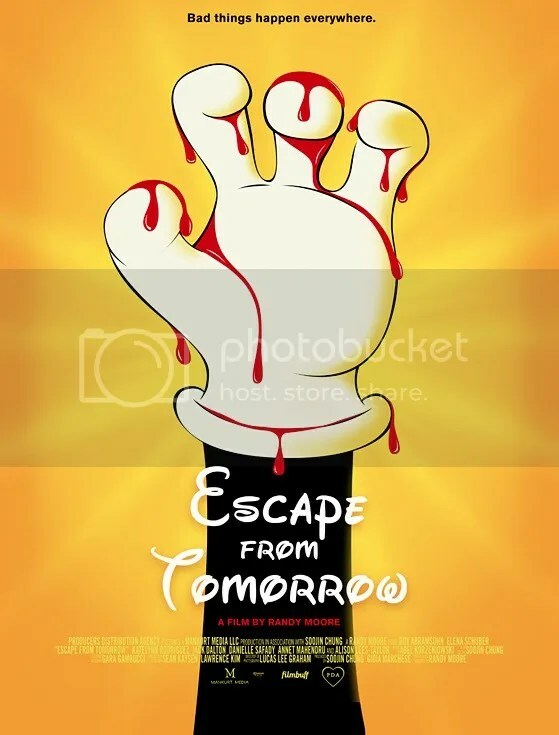 Escape from Tomorrow sounds like an interesting curiosity and it is. Unfortunately the back-story of how the picture was created is more fascinating than the film itself. The problem is this fantasy really doesn’t go anywhere interesting. The downward spiral of the tale is sort of a hallucinogenic head trip – but it’s incoherent. There’s a buried subtle critique that even Disney World’s sunny happy facade can’t mask true depression. But this has more to do with negativity in this family’s life than a comment on the actual merits of the park itself. For most of the drama I was intrigued where the chronicle would go. Then the movie takes a particularly nasty turn 10 min from the end that dares the audience to keep watching. It devolves into a scatological creepshow. Shame because with some judicious editing and more intellectual mindset, this could’ve been a perceptive commentary on the artificiality of the happiest place on earth. After screening at the Sundance Film Festival, there was some speculation that future audiences would never see Escape from Tomorrow because of legal difficulties. The work most likely falls under the fair-use doctrine as parody and therefore not subject to copyright law. Whatever the reason, Disney has decided to ignore the production so as not to bring more attention to it. You should probably do the same. This entry was posted on October 14, 2013 at 8:00 pm and is filed under Drama, Fantasy, Horror. You can follow any responses to this entry through the RSS 2.0 feed. You can leave a response, or trackback from your own site. hmm…i dont know though, this just sounds so interesting. but i’ll consider myself fairly warned when I find myself disappointed afterwards. That’s what got me interested in the film, the back-story. Then I saw the trailer and it had these touches of surrealism that had me thinking about David Lynch. I was all set to love it. Something interesting happens though as it plays out. The more you watch, the more haphazardly thrown together it gets. It desperately needs a solid ending. It doesn’t have one, but even worse, it ends with a gross-out gag so your last thought is the whole exercise was just a waste of time. Yep. This is mostly what I’ve been hearing about this. How they filmed it is far more interesting than the actual movie. Still, I’m curious. Nice review. I think they sort of got a little too carried away. The ending was crazy. It’s too bad they didn’t come up with a better screenplay because the filming process is really intriguing. Intriguing is the word. The idea is brilliant and the trailer had me salivating at the possibilities. Oh what could’ve been! I’d be interested to hear you thoughts after you see it. Well, I’ve seen it, and since you asked, I’ll share my thoughts. The first time I looked at your review, I skimmed it to get the general idea without biasing myself on too many of the details. Now that I’ve written my review, I’ve read yours it in its entirety, and I basically agree with you. The twist near the end is nigh unbearable, but the visual style is fascinating. I even think the awkward green screen effects work pretty well for the movie. In the end, though, it doesn’t say much and doesn’t go anywhere all that interesting. My more complete review is up on the site if you’re interested. I enjoyed your review. I always think how would I answer the question from a reader that asks, “Should I see this movie?” I think for most critics a B- (or 3/5 stars) is still a recommendation barely and a C+ (or 2.5/5 stars), while not horrible, is a movie that is not recommended. Of course you can define your grades anyway you see fit. That’s just my perspective. That might be true vis a vis most critics, and so it is a fair perspective. I have been thinking of anything C+ or better being recommended for most audiences, a C for some. Why? Because anything C+ or better is above average. I don’t recommend anything with a D letter grade (including Escape From Tomorrow). Insofar as I’m defining the grades a bit differently, a definition of them would be wise. I’ll get one up at some point in the coming days. So thanks for the feedback! The goofy music was pretty funny. Sometimes the solution to a problem (copyright issues) stimulates something more creative. Too bad the whole film wasn’t as inspired. Saw you on RT as one of the top reviewers! Great review on this tough to get through film. I more or less agree with you on everything. Thant’s awesome. Glad to see people are reading my reviews. Thanks!